Ronny Siewart recently joined the Grand Hotel Heiligendamm in March 2008 as the Chef de Cuisine of the Michelin star Friedrich Franz restaurant after honing his craft at Residenz Heinz Winkler (3 stars), working with the renowned Chef Dieter Müller (3 stars), and Chef Helmut Thieltges (3 stars). 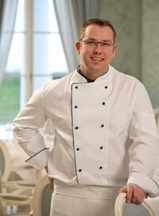 His focus is on classic French cuisine for the gourmet restaurant, Friedrich Franz. Method: Add all ingredients to a pot and cook until the liquid is almost evaporated. Season to taste. Potato-Leek Cream Method: Peel the potatoes and cut into small cubes. Cook with the white part of the leeks in a little vegetable oil. Add the dry white wine and the stock and cook until reduced by 2/3. Add the cream and the green part of the leeks, and puree in a kitchen mixer. Strain through a fine sieve, taste and season accordingly. Horseradish Foam Method: Core the apple and cut in small pieces. Add the butter to a pot with the fresh horseradish and make a roux. Add the freshly pressed apple juice and cook until reduced by half. Add the cream and the stock and cook until the apples are tender. Puree the sauce and taste.